Looking for soccer decorations and party supplies to celebrate the end of your team’s winning season or to celebrate the international tournament? Maybe you are looking to throw a soccer theme party for your star? A sports theme is fun for boys and girls of all ages and can even be used to decorate for a team banquet. Let us help you create a soccer field right at home or in any event space! With our artificial grass, ball photo and balloon holder you can create your own soccer field centerpiece or use one of our international soccer team centerpieces. We have great table decorations and tableware for your party with international teams or just a generic soccer ball and field table set. Make sure the players take home a memorable inflatable soccer ball that all their team mates signed so they can remember their winning season! Whatever your soccer party idea is we have all the party supplies and decorations you need to create the perfect party. GOOOAAALLLL! Have a soccer party idea? With the help of PartyCheap.com you can create the perfect soccer party for you. We have everything you need to throw a soccer birthday party or a soccer theme party for a sports banquet. 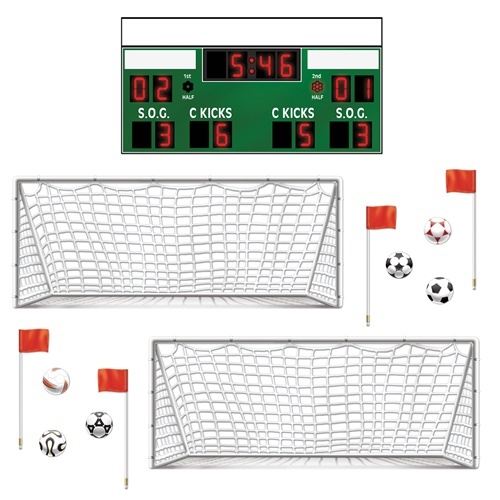 You can browse through all of our soccer decorations and party supplies here or use the search feature to find a specific related party supply. Soccer is very popular and only getting bigger. It is a sport that has appeal to both boys and girls. The Soccer Ball Cutouts have been in high demand because they can be used for birthday parties, gym classes, sports banquets and sports bars. You can place them on the wall or attach a string and turn this ordinary cutout into a hanging decoration. You definitely want these Soccer Ball Cutouts at the party. Check out our Stadium Insta-Theme to hang up at the party so that the guests feel like they actually have a game! Click on the link to not only see the Stadium Insta-Theme, but enjoy our new Drag ‘N Drop feature! It will allow you to see how different pieces will look on the backdrop! Listen to all of the songs of the FIFA World Cup 1962 - 2018! See the full list of players for the 2018 FIFA World Cup here! Q: What position do ghosts play in soccer? Q: Where do soccer players go to dance? Q: Why shouldn’t you play soccer in the jungle? Q: Why do soccer players do so well in school? Q: Why don’t grasshoppers watch soccer? A: They watch cricket instead. Each player gets a ballon, at the start signal players toss their balloons above their heads. Players must keep the balloon in the air using only their heads. Once a balloon hits the ground, that player is out of the game. Last person still playing wins. Add a soccer theme to the game of freeze dance. Choose someone (preferably an adult) to be the referee and give them a pad of yellow sticky notes. Players dance while the music plays, but must freeze each time the music stops. The referee decides who was the last to stop dancing and "Yellow Cards" them with a sticky. Anyone who gets to Yellow Cards is out of the game until only one remains.